Broil the steaks for 4 minutes, then take the pan out and turn the steaks, and broil for 5 minutes longer. 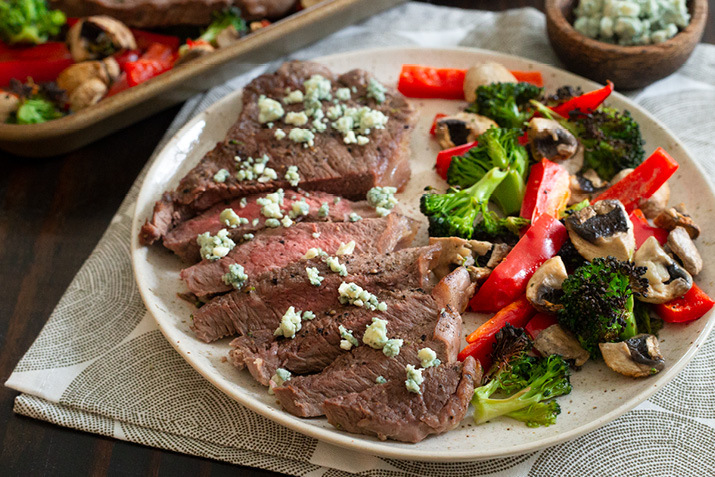 Remove from the broiler; transfer the steak and vegetables to plates, and sprinkle each steak with bleu cheese. Serve a rich Cabernet Sauvignon with this hearty dish. Prefer cauliflower to broccoli? Or green peppers over red? This recipe is a great base for improvisation, so choose the vegetables you love.